What Can I Do if My Baby Was Oxygen-Deprived at Birth in Ohio? Many parents whose children have been recently diagnosed with hypoxic-ischemic encephalopathy don’t know that an HIE diagnosis can be associated with medical malpractice. Of course, many institutions and hospitals will try to protect themselves by not providing families with the whole picture about what caused their child’s HIE. Often, the only way for parents to hold them accountable for their mistakes is to get the help of a birth injury attorney….So what is it that parents should know that hospitals won’t tell them? Hypoxic-ischemic encephalopathy (HIE) is the formal name for a kind of brain injury caused by oxygen and blood flow deprivation to the brain. Colloquially, some people refer to HIE as ‘birth asphyxia.’ It doesn’t exclusively happen in babies and children, but the attorneys at ABC Law Centers have built their practice specifically around helping children with HIE, cerebral palsy, and developmental delays stemming from pregnancy, labor and delivery mistakes. Most babies are born healthy without complications, but there are some that are unfortunately injured during labor and delivery or are impacted by poor prenatal care, causing injuries that could have been avoided. Care of a child with disabilities can sometimes be a financial strain – and that’s where the birth injury attorneys at ABC Law Centers come in. Our one and only goal is to help parents secure the resources for their child’s therapy, care, and other resources they need to live a happy and secure life – no matter what. If your baby was born in an Ohio hospital like Cleveland Clinic, University Hospitals Case Medical Center, Ohio State University Wexner Medical Center, or Christ Hospital and has been diagnosed with disabilities related to HIE, the lawyers at Reiter & Walsh can help. We are a group of nationally recognized birth injury attorneys that have represented hundreds of children in and around Ohio affected by HIE. We will review your child’s case free of charge and determine if medical errors caused the HIE. If so, we will fight aggressively to obtain the financial security your child deserves. How Common is HIE, and What Impact Does It Have? HIE, a preventable injury, occurs in 2 – 9 per 1,000 live term births in the United States. 10% to 15% of affected infants die during the neonatal period, and 25% to 30% of surviving infants will have permanent neurological damage. There are many long-term effects of HIE. Furthermore, brain damage may not become apparent until several years after the hypoxic-ischemic insult. The long-term effects of HIE depend on the severity of the diagnosis. Generally, the longer the baby is without oxygen, the more severe the HIE. Some children with HIE receive brain cooling and have little to no impairments, In other cases, where the HIE is more severe, disabilities may include cerebral palsy, seizures and epilepsy, visual and auditory impairments, physical disabilities, cognitive disabilities, or intellectual and developmental disabilities (I/DD). Tests for HIE usually are performed when an infant needs resuscitation after complications that occur during the birth process. Abnormal findings on the neurological exam in the first few days after birth are the single most useful predictor that brain insult has occurred in the perinatal period. Complications often arise during pregnancy, labor and delivery that require special attention from the physicians and medical team. While every pregnant woman relies on her physician to provide the best possible care, sometimes physicians and the medical team fail to do this and standards of care are violated. Sadly, this can mean HIE and permanent disabilities for the baby. Trauma to the baby’s head during delivery can cause brain compression and brain bleeds / hemorrhages. Undiagnosed or poorly managed conditions in the mother, including high blood pressure (preeclampsia) or infection. Umbilical cord injuries like prolapsed cord, nuchal cord, and cord compression can all interrupt blood and oxygen flow to the baby. Complications related to the baby’s size (macrosomia or cephalopelvic disproportion) or position (breech) can cause injury. Premature birth can cause babies to be vulnerable due to underdeveloped lungs, which can lead to oxygen and ventilation problems. Problems with the uterus or placenta such as placental abruption, placenta previa, ruptured uterus, or placental insufficiency. Delay in performing necessary C-section. Right now, there is only one medical treatment for HIE, and it is administered within 6 hours after birth. This treatment, called hypothermia therapy, cools down your baby’s brain and reduces your baby’s metabolic needs to allow the baby’s brain to heal. Hypothermia therapy is also known as therapeutic hypothermia, brain cooling, body cooling. Hypothermia therapy can reduce the child’s level of disability and help them make functional improvements. The impact of the treatment will vary depending on the severity of the initial injury, as well as other factors. One the baby has received hypothermia therapy using either a cooling cap or a cooling blanket, medical professionals generally recommend that the child be closely monitored and if necessary be enrolled in Early Intervention and therapy to help reduce developmental delays. What Can Parents Do If Their Child Was Diagnosed with Hypoxic-Ischemic Encephalopathy (HIE) in Ohio? One of the most important things that parents can do is secure therapy for their child at a very young age. The earlier a child gets therapy, the larger their functional gains could potentially be. The second step would be to speak with a birth injury attorney, because a birth injury suit could help you cover the costs of your child’s care that aren’t covered by medical insurance or other resources you have available. Birth injury and hypoxic-ischemic encephalopathy cases are very complicated – they require the use of numerous experts in nursing, neonatology, obstetrics and gynecology, neurology, rehabilitation, and other specialized fields to move the case forward, along with a deep and thorough understanding of both legal procedure and medicine. That’s why it’s very important to have a law firm handling your case that focuses only on specifically birth injury. Other firms that say they handle birth injuries and HIE may have many different departments that handle things like pharmaceutical issues, dog bites, slip-and-fall cases, and car accidents – but those cases are very different from birth injuries. Those kinds of firms may only handle a few birth injuries a year; many handle none and instead refer birth injury cases to niche practice firms. At Reiter & Walsh, P.C., however, our Ohio hypoxic-ischemic encephalopathy attorneys focus solely on birth injury – we handle nothing else. 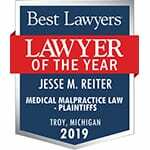 Attorney Jesse Reiter is admitted to practice in Ohio and in the Ohio Supreme Court. This gives us the experience and understanding needed to successfully secure your child’s care in a medical malpractice case. Think about it like this: you wouldn’t go to your general physician for heart repair surgery – would you trust your child’s birth injury case to firms that don’t focus on birth injury? Please call us at 888-419-2229 if you’d like a free consultation for your child’s birth injury case. Your information is 100% confidential.